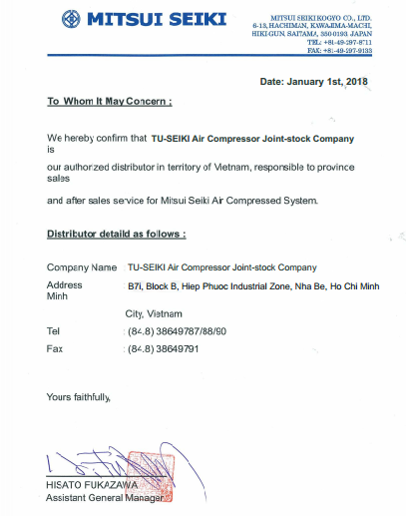 TU – SEIKI Air Compressor Joint Stock Company (TU-SEIKI) is a member company affiliated with Thang Uy Group (TUG), established under the technical sponsorship from Mitsui Seiki Kogyo Group in 2014. With long-term operational experience, along with the trust of technology transfer from Mitsui Seiki Group, a Japanese-based corporation with more than 80 years of experience in the air compressor industry, we launched the factory located at Industrial Park HiP Phuoc, Nha Be, Ho Chi Minh, assemble the first oil-based industrial air compressor in Vietnam using the exclusive Z-Screw single screw compressor technology supplied by Mitsui Seiki. 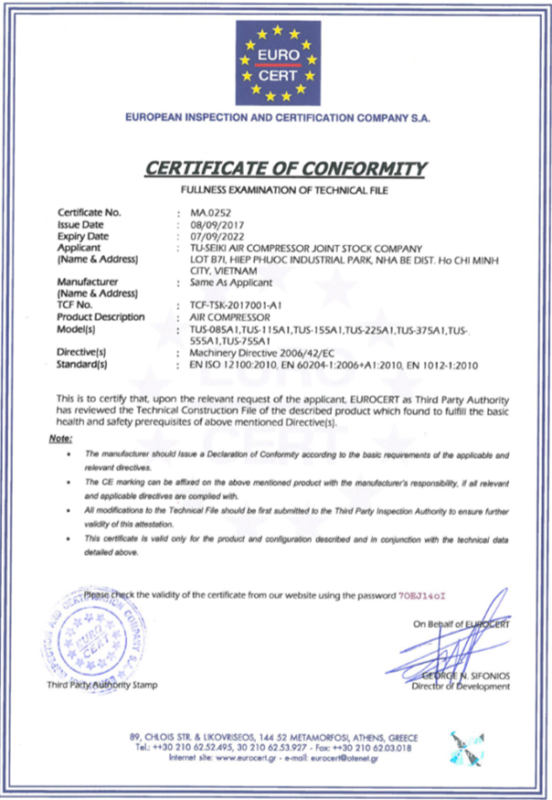 TU-SEIKI products are manufactured according to CE and ISO 9001: 2015 quality standards. 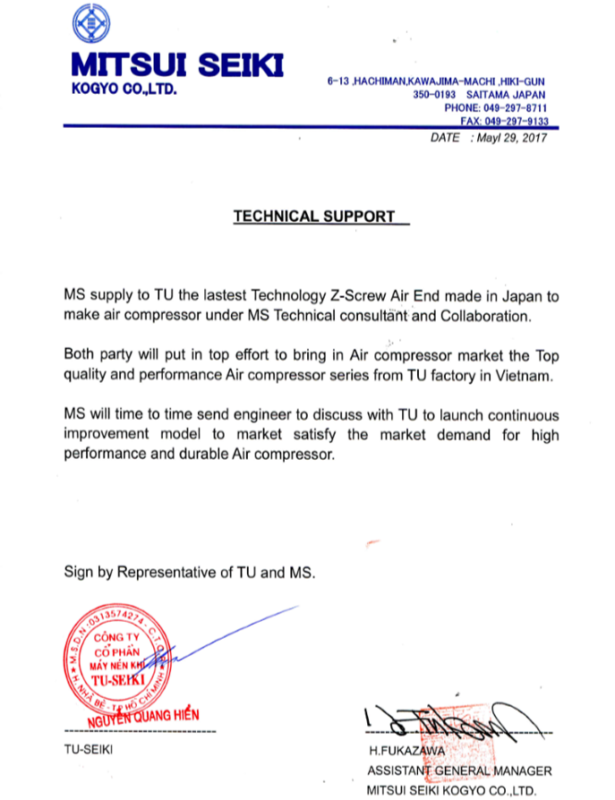 In addition, TU-SEIKI is the official distributor in Vietnam, Laos and Myanmar markets of famous air compressor brands, air dryers and gas processing equipment in the world such as: MITSUI SEIKI (Japan), SPX – HANKISON (Korea / USA) … Coming to TU-SEIKI, you will be provided with products and services on air compressors, air dryers and parts for factories and zones. Industry with prestigious brands at home and abroad, meeting all the needs of customers. 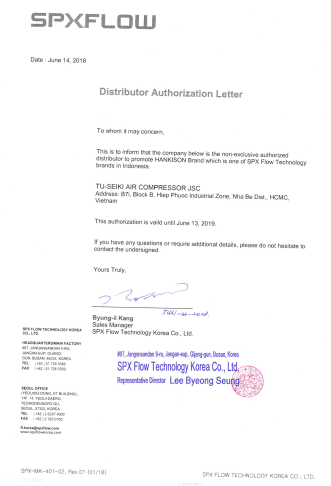 TU-SEIKI has become a total and comprehensive solution of industrial air compressors in Vietnam and prestigious in the international market. TU-SEIKI is constantly innovative to bring more value to customers as well as to bring prosperity to employees, shareholders, partners and contribute positively to the community. 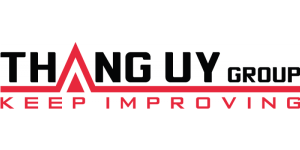 ISO 9001: 2015 is the international standard for quality management system by the International Organization for Standardization (ISO), fully named “Quality Management System – Requirements”. 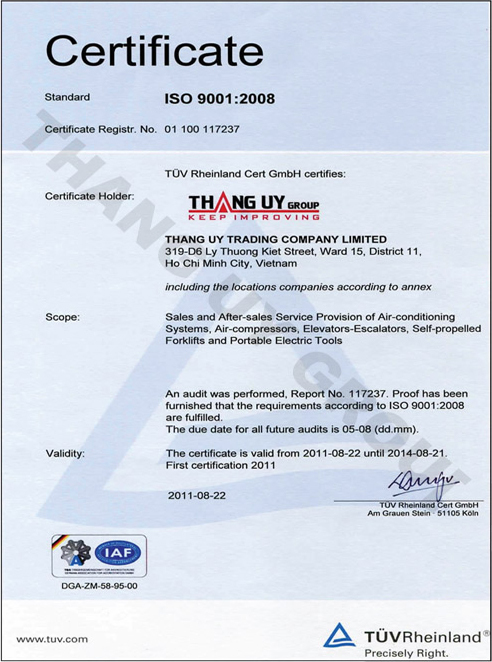 This is the standard ISO 9001 issued for the 5th time in 2015 and is also the latest version of ISO 9001. Applying ISO 9001: 2015 to production and business activities to help enterprises: Institutionalize the working apparatus, clarify the role and scope of each individual’s responsibility for him to clearly see his duties and powers in an administrative group; Set standards to build a quality management system scientifically to control risks, prevent errors, produce / supply quality products / services; Satisfy customers in a stable way, also needs to have the trust of customers, investors and employees.